Do you need Soy bean meal or canola meal in your products? Is there a particular Color or consistency you require in your ingredients? Are you looking for certain levels of protein or fat? At Proteus, we can leverage our global network to find the product that fits your exact needs. North America is blessed with an abundance of agricultural products and an abundance of food industry co-products. 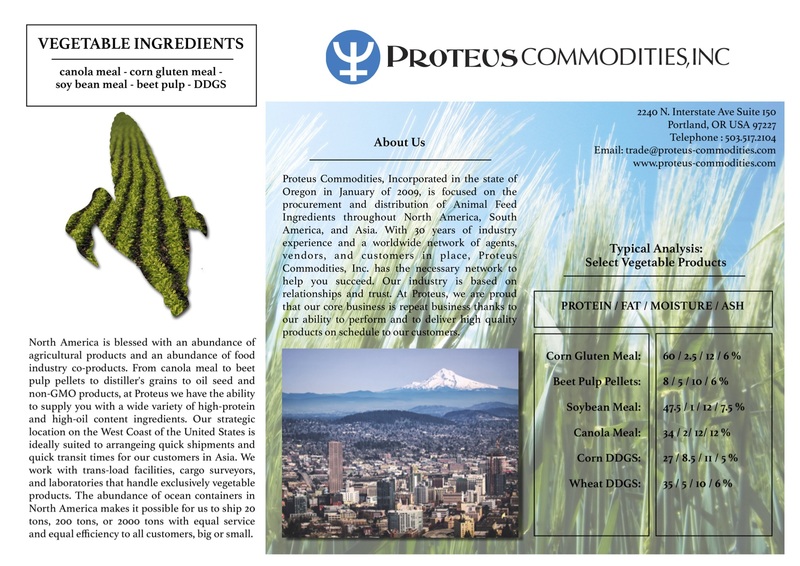 From Canola meal, to Beet Pulp Pellets to Distiller’s Grains, to oil seeds and Non-GMO products, at Proteus we have the ability to supply you with a wide variety of high-protein and high-oil content, ingredients. Our strategic location on the West Coast of the United States is ideally suited to arranging quick shipments and quick transit times for our customers in Asia. We work with trans-load facilities, cargo surveyors and laboratories that handle exclusively vegetable products. The abundance of Ocean Containers in North America makes it possible for us to ship 20 tons, 200 tons or 2000 tons with equal service and equal efficiency to all customers, big or small.